Brief biography: b. 1976, Beligum. Lives and works in Manchester, England. Mishka Henner is one of the UK’s most significant artists working with and interrogating the photographic medium. Based on the collection and mediation of publicly available imagery sourced through the internet, satellites and television, his appropriative practice explores the use and value of photography and its relationship with contemporary experience. 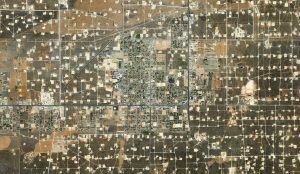 Wasson Oil and Gas Field, Yoakum County, Texas is from Henner’s Oil Fields series of large-scale photographic prints each of which is composed of hundreds of high-resolution satellite images of each location stitched together to show intricate detail. The prints are reminiscent of vast Abstract Expressionist canvases and represent landscapes carved by industries meeting extraordinary levels of consumer demand for one of North America’s most prized commodities: oil. Sourced from Google Earth, these satellite images of oil fields represent a systematic intent to maximise production and yield in order to satisfy extraordinary levels of human consumption. The result is a natural landscape transformed into something akin to the circuit boards that drive the logistical operations of these industries, and ultimately, feed consumers’ appetite for these resources. Henner was shortlisted for Consumption, the Fifth Prix Pictet Award, 2014, and in 2013, he was awarded the ICP Infinity Award for Art by the International Center of Photography, New York, and shortlisted for the Deutsche Börse Photography Prize at the Photographers’ Gallery, London. His work is held in collections including the Tate Library Collection, London; Victoria & Albert Museum, London; the Centre Pompidou, Paris; the Metropolitan Museum of Art, New York; New York Public Library, the Nelson-Atkins Museum of Art, Missouri; Museum of Fine Arts, Houston; Portland Museum of Art, Maine, and the Cleveland Museum of Art, Ohio. Henner has exhibited internationally in numerous group shows and surveys, and is a member of the ABC Artists’ Books Cooperative. Mishka Henner’s Cedar Point Oil Field, Harris County, Texas, 2013-2014 from the Oil Series is also in the University of Salford Art Collection. 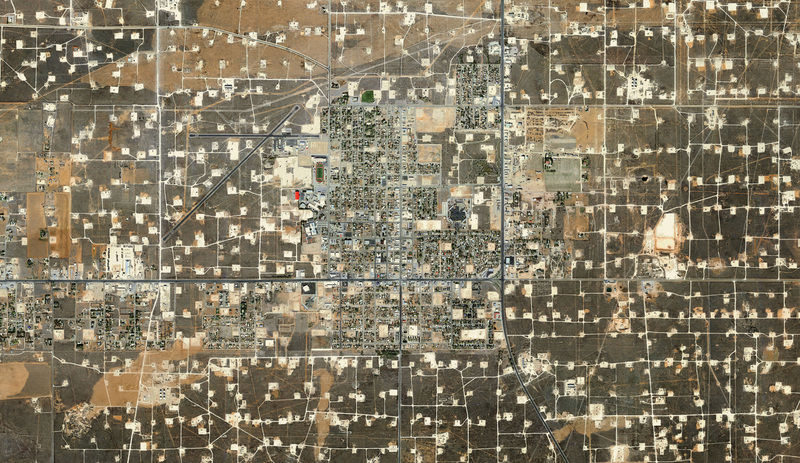 Danny Morrell in conversation with artist Mishka Henner about Wasson Oil and Gas Field, Yoakum County, Texas.